Fascinating guide to locating bones, muscles, ligaments, and more! Before you can assess or treat a structure in the body you must first locate it. 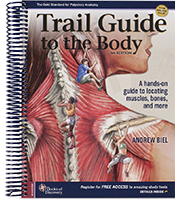 Designed as a hands-on tour, Trail Guide to the Body will teach you to palpate the body's structures with ease and precision. Whether you are a massage therapist, physical therapist, sports trainer, or student in any bodywork modality, Trail Guide to the Body is for you! Includes: over 850 illustrations, 101 muscles, 206 bones, 23 ligaments, 91 bony landmarks, tendons, arteries, veins, nerves and more.